John always preached, "Someone who has more power than I will soon come after me. I am not worthy to even bend down and loosen his sandal strap. 8 I baptize you with water, but he will baptize you in the Holy Spirit!" 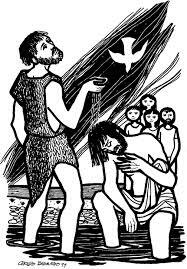 9 During that time, Jesus came from Nazareth in Galilee and was baptized by John the Baptist in the Jordan river. 10 When Jesus came out of the water, he saw the sky open at that moment and the Holy Spirit come down like a dove. The Spirit entered Jesus. 11 There was a sound from heaven. "You are my Son, the sound announced, "I love you and I am very pleased with you!" Gwen was a young girl. She always worked hard, but she got easily frustrated. Many times people could hear Gwen scream and stamp her foot, not at another person, but at something she just didn't get. Gwen loved softball most of all. She practiced hitting and fielding. But she wanted something more. She wanted to pitch. In her backyard, her father set up pitching mound and target box. Everyday before dinner, Gwen practiced pitching. Overhand, underhand, and side-arm. When she missed, she would grunt and groan. When she got it, she would smile and whisper, "All right!" As she improved, she wanted to learn to pitch a slider. "That's a very difficult pitch," her coach warned her. The next month was frustrating for everyone. Gwen worked hard, but just could get the mechanics of the pitch. Her coach kept trying to move her arm in just the right way, but to no good. When the day of the first game arrived, the coach announced Gwen would be playing center field. "Coach!" she said out loud, "I want to pitch." "I know, Gwen," the coach responded, "but you can help the team the best fielding. You're very good at it." In anger, Gwen stomped onto the field. The game was tight. At the end of the fourth inning, the score was tied. Then, Gwen's team got in trouble. After two hits and a walk, the bases were loaded. The coach went out to talk to the pitcher. Then he turned a signaled for Gwen to approach the mound. Surprised, Gwen ran to the coach. "You wanted to pitch," the coach announced, "now you can." He tossed her the ball and walked back to the dugout. The catcher called for a fast ball and Gwen delivered. Strike one. Another fastball. Strike two. The catcher then called for a slider. For a moment Gwen felt panic. She said a quick prayer and tried to remember what her coach told her. Then, she wound up and threw the ball. The ball left her hand like a fast ball and at the last moment, slid away just catching the edge of the plate. Strike three. Gwen stood there with her mouth open. Then she jumped into the air. "I got it!" She shouted. Her coach agreed. "Yeah!" he shouted in return. It just takes a moment to understand, to know what you need to do. Jesus had that moment, just like Gwen. At his baptism, he got it. His Father poured the Holy Spirit on him and he knew what he had to do. He had to share that Spirit with others. Now he had the power to help others follow God's will. Have you ever had a time you understood others needed your help? What did you do? How did God help you at this moment?